From child prodigy to elder statesman of American pop, soul, R&B, jazz and funk, Stevie Wonder's masterful musical journey has already stretched a remarkable 55 years and continues to evolve while marking major mileposts: his fifth album, Up-Tight, released when Wonder was only 16, marked its fiftieth anniversary in early May. Although he's not released an album since 2005's A Time To Love (which featured his much-missed friend Prince on guitar for "So What the Fuss"), Wonder effortlessly sold out his Songs in the Key of Life tour in 2014 and 2015, filling major arenas like New York's Madison Square Garden. There seems no era in which Wonder's songs, probing social injustice, romantic desire, urban life, marriage, fatherhood, and black pride and achievement, haven't been a part of this country's cultural fabric or soundtrack. His potent, soulful legacy was reflected in the younger superstars he inspired and outlived—like Prince and Michael Jackson. It still thrives in a vibrant array of artists encompassing many generations, like Alicia Keys, Kendrick Lamar, John Legend, Mayer Hawthorne, Janelle Monáe, Drake, Erykah Badu, Flying Lotus, Pharrell Williams, The Weeknd, and Elton John (who once confessed to Rolling Stone that he brings a copy of Songs in the Key of Life with him wherever he goes). Originally nurtured by Motown's Berry Gordy and associates as a youthful echo of Ray Charles from 1962-1972 (both Wonder and Charles were prodigies who happened to be blind), thereafter Wonder made an ambitious artistic leap. He dramatically altered his artistic perspective to something more profound than mere pop hits. Catchy, early '60s chart toppers like "Fingertips," "Uptight (Everything's Alright)," or "My Cherie Amour," gave way to his epic, resonant albums of the early '70s, like Music of My Mind, Talking Book, Innervisions, and Fulfillingness' First Finale, the latter two releases concurrently winning Grammys as Album of the Year in 1974 and 1975. Wonder, who was born Steveland Morris in Saginaw, Michigan, vividly lived up to his stage name by taking control of his own music and publishing. In addition to producing and playing virtually every instrument on his albums, he was inspired by his first wife, the songwriter and singer Syreeta Wright, and peers like Marvin Gaye and Curtis Mayfield. Like them, he assertively addressed the critical social and political issues of the day, all which still resonate: war, civil rights, inequity, and systemic racism. He excoriated President Richard Nixon ("He's Misstra Know-It-All," "You Haven't Done Nothin'") and lamented the scourge of bigotry ("Living for the City," "Black Man," "Pastime Paradise"). His critical and commercial masterpiece, 1976's double album Songs in the Key of Life, was a project which took him two years to painstakingly record and refine. Wonder not only recorded the most celebratory anthem for any overwhelmed father holding his wailing newborn daughter ("Isn't She Lovely"), but also pondered spiritual love ("As"), inner city anguish ("Village Ghetto Land") and global unity ("Ngiculela/Es Una Historia/I Am Singing"). That spirit of activism carried Wonder into the Eighties with Hotter Than July which included "Happy Birthday," written in honor of Martin Luther King, Jr. and concurrently underscoring the campaign to have the civil rights leader's birthday established as a federal holiday. That proposal was finally signed into law in 1983, but not observed until 1986. Although the '80s pop charts were awash with New Wave and synthpop, Wonder still dropped destined-for-the-mainstream hits, like his George Martin-produced duet with Paul McCartney, "Ebony and Ivory," and 1984's midtempo ballad "I Just Called To Say I Love You" from the soundtrack for The Woman in Red, a song which won Wonder an Academy Award (and has also cropped up, for better and worse, on plenty of telecom commercials over the last 30 years). He threw his efforts behind charity singles like "We Are The World," for African Famine Relief, and "That's What Friends Are For," the proceeds of which raised funds for the American Foundation for AIDS Research. As the '90s commenced, Wonder worked with director Spike Lee on a soundtrack for the film "Jungle Fever" and released one other album, 1995's Conversation Peace. A decade passed before he would release another studio album, 2005's A Time to Love, which remains his last to date. Wonder has long been a generous, serial collaborator, lending his harmonica prowess to scores of songs, including Chaka Khan's cover of Prince's "I Feel For You," Drake's "Doing It Wrong," and Sting's "Brand New Day." He has also contributed keyboards to more songs, including Minnie Riperton's "Lovin' You" and Roberta Flack's "Don't Make Me Wait Too Long," and has duetted with Babyface, Tony Bennett, Whitney Houston, Bono and many others. In 2016, Stevie Wonder, who turns 66 on May 13, is most often found performing onstage—recently he appeared in Los Angeles for a Prince tribute concert, leading artists in a touching cover of "Purple Rain." A July concert in London's Hyde Park, also featuring Pharrell Williams, Corinne Bailey Rae and King, is already sold out. And last fall, he even took an endearing carpool karaoke spin with host James Corden of "The Late Late Show," a clip which has racked up an astonishing 20 million YouTube views. A resilient, visionary man and musician who has managed to gracefully arc from genius child act to brilliant (and normal) adult superstar, this artist and dreamer continues to inspire his fans and fellow musicians. The overriding message of so many of his songs—embracing humanity, love, empathy, equality and peace—remains as potent today as it did when his albums were first released. 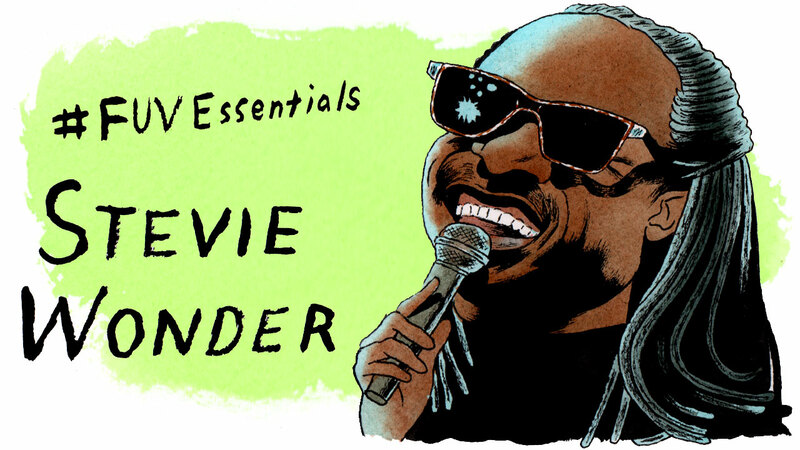 Stevie Wonder is, to awkwardly paraphrase, absolutely signed, sealed and delivered as one of our FUV Essentials.